Hello Common Cents Mom readers, from Sneaky Pete the Savvy Thrifter. I’m writing this guest post, reacting to the article on Torontonicity, Secrets of a Thrift Store Technology Picker, which I thought was pretty clever. But I also reckoned I might share with you some of my own tactics for Thrift Store picking and especially the game we call Pick-n-Flip. Pick-n-Flip – Participants shop local and then sell items online. We play over an entire shopping season (three months). No I’ve never won. And I have a half dozen friends who play the game with me, and they’ve never won either (you have to end the season in profit). Its a tricky thing and unless you watch yourself you could become a ‘hoarder’ when your merchandise doesn’t ‘flip’. The secret to being a successful picker is to have buyers waiting in the wings, or at the very least a physical store shelf to properly display items for resale. If you don’t have that you’ll probably destined to become a Hoarder. Thrift stores and flea markets are poor places to prospect for bargains compared to estate auctions, yard sales and community rummage sales. The last three venues are essentially clearing houses, and this is where most pickers find impossible deals and maximum profits reselling rare merchandise. But let’s remember, auctions and yard sales are special occasions; they are time-sensitive events. Finding and buying anything at one of these big sales usually requires traveling some distance and waiting in crowds before bidding in live auctions. 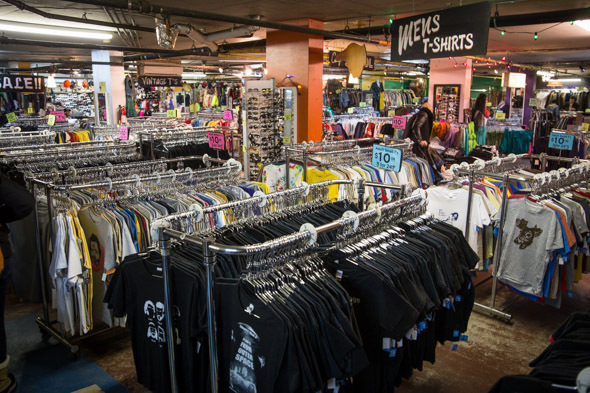 Thrift stores by contrast are everywhere, and easily accessible. and you can buy whatever you find right on the spot. The charity thrift store model essentially resells donations from the public, . These stores are not charities; they’re for-profit businesses which donate a portion of the proceeds to charity. 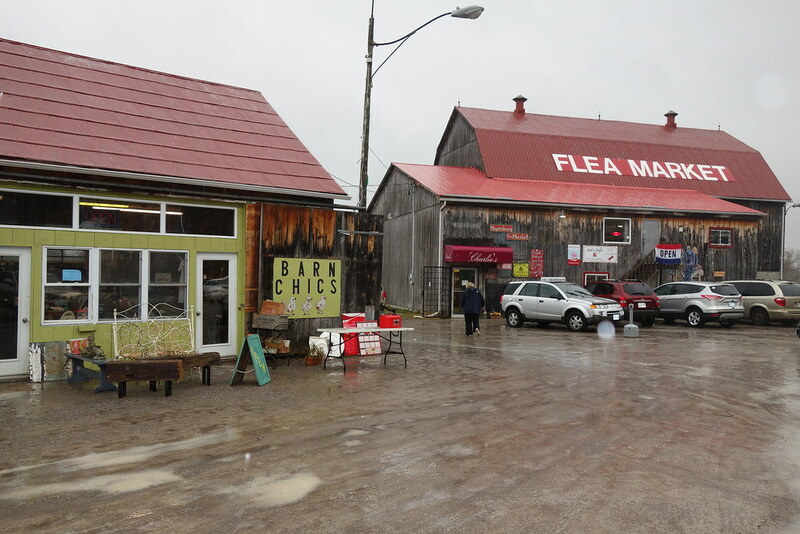 Rural community thrift bazaars like the Meyersberg Flea Market pictured above are better places for finding bargains as locals really don’t know international prices or even the market prices set in neighbouring urban centers. 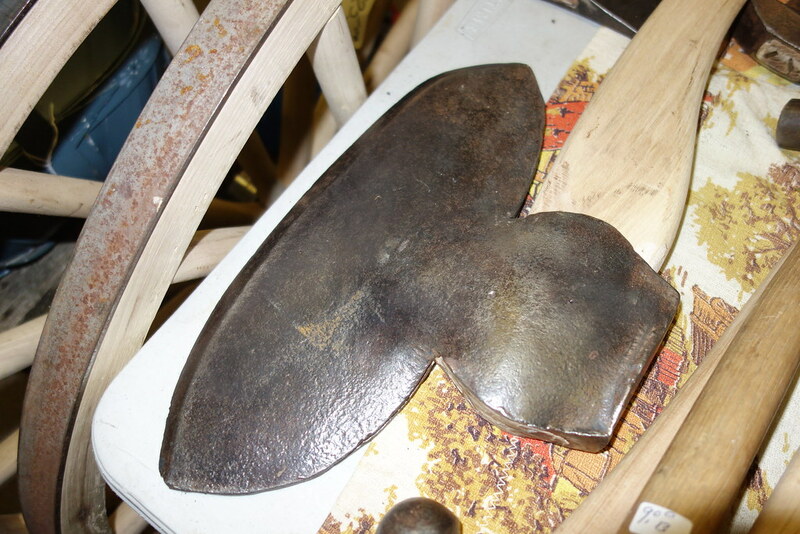 Homemade iron ‘broad axe’ for sale,, only $79 including the Hickory wood handle! For example, when visiting the Meyersberg flea market be sure and visit the iron monger who sells handmade iron broad axes for what Sneaky Pete perceives as a mere fraction of their true market value. What cottager wouldn’t want a homemade iron implement like the one seen above on hand to split kindling and log wood for their fireplace? You just don’t see this stuff, or these prices here in Toronto. Salvation Army and Value Village are two of the biggest chains here in the city, but there are many smaller shops, Like even Black Market Vintage on Queen, seen below. has deals that frugal moms might miss while knowledgeable Fashionistas can spot vintage North American classic clothes that are still cheap and plentiful here, but hard-to-find and expensive overseas. Experienced shoppers who do set about ‘picking’ through Value Village and Salvation Thrift Store shelves might be tempted to peruse the clothing section looking for vintage leather jackets, flight suits, satin shirts, and handmade Alligator skin shoes. Or they might wander the kitchenware aisle hunting collectible coffee mugs, Jadeite cups and saucers, and real silverware. While there, experienced pickers would be surely scour the bottom shelves looking for unusual shaped chocolate molds. A quick search for rare books usually yields something in every store in Toronto. Sneaky Pete seeks out original graphic novels, and ‘official’ corporate colouring books and Big Little books. 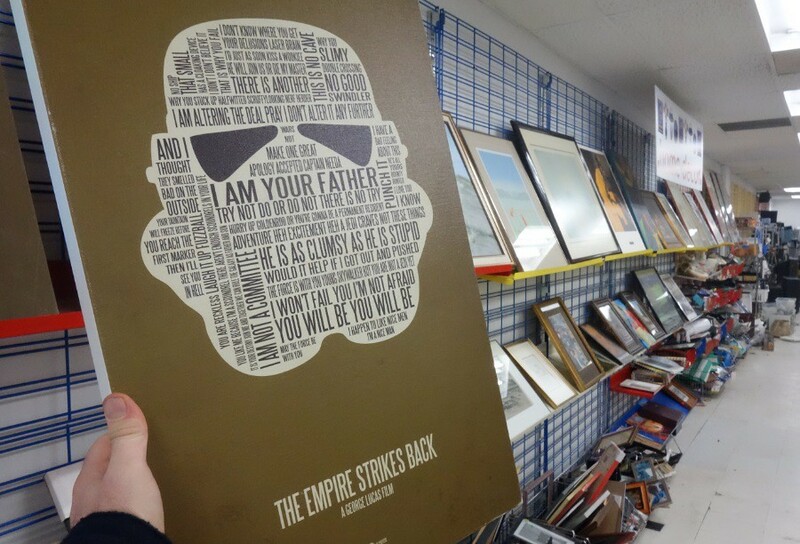 Near the book section there’s generally two racks of paintings and commercial art; like this vintage Lucas film poster art which sold for $60 new and is available here in Value Village today for ten bucks. That’s a steal. Finding such obvious bargains at these places often requires perfect timing because every picker worth her salt knows that Star Wars stuff sells – but what else is there? How else can you know what’s in demand before you buy the item in a thrift store? Why not take a minute and explore online the many ‘Wanted Lists’ published online everyday? The Toronto Wanted section of Kijiji,and on Craigslist and other smaller (less frequently updated) ‘swap and shop’ type sites – check the lists once or twice a day. Desperate people on these pages are always looking to replace proprietary phone chargers and battery backs and power adapters etc. Lori mentioned how Standard Telecom buys and sells office phone networks, and to keep a particular eye out for the Nortel 9417CW. And this brings Sneaky Pete to reflect on the tenacious Thrift Store price tags (also mentioned in Torontonicity’s Thrift Store picking article). How does one remove those pesky stickers off painted surfaces, and especially plastics.without damaging the finish? There’s about eight bucks worth of rare earth metals (including gold) in a desktop computer, and even more in a laptop computer. The good people at KPDI digital solutions agency in Toronto accept e-waste from thrift stores which scrap for charity and Sneaky Pete sometimes helps out in the fun. 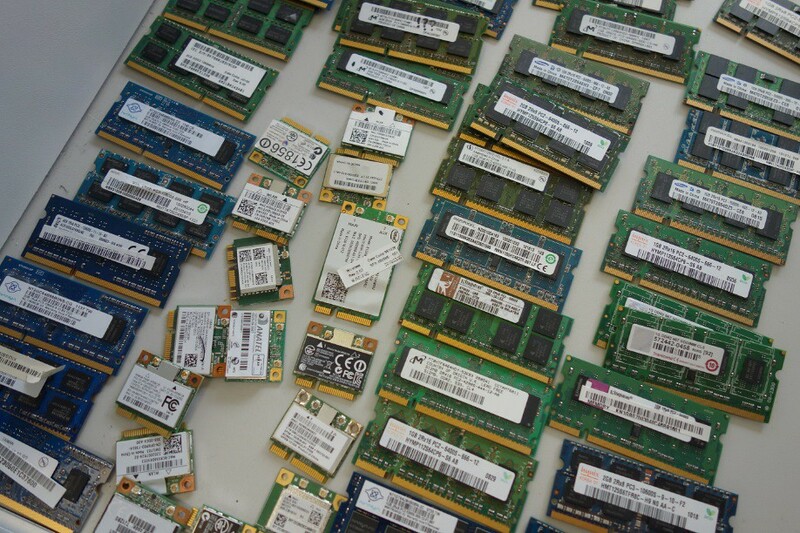 Broken computers and laptops are not ‘junk’ until they have been stripped of the chips and capacitors. When stripping computers search for monolithic capacitors, rhodium and Tantalum capacitors. Its common for these chips to have silver conductors, but more importantly the rare earth metals inside these cylindrical components are worth more than gold. Do not open them up to look, as they are toxic and worse the metal will oxidize quickly and be worth less money. Old Polaroid cameras are almost always worth the asking price if they still work. 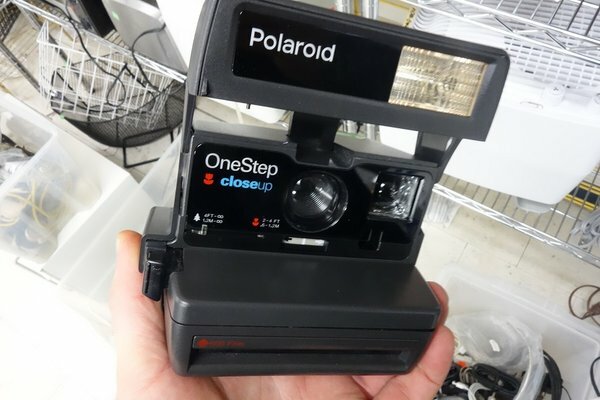 See here this definitive article on buying selling Polaroid cameras by Dan Finnen shows this camera and how to appraise its value with links to the (his) Polaroid camera section on eBay. Sometimes the managers of donation based thrift stores have problem pieces which they don’t know how to display or price properly. They may be convinced to sell these difficult objects to you for whatever price you divine assuming you can prove some market price index using eBay or another online catalog. Even more fruitful is to find items with problems you can solve at home – repairs, missing components, and TLC. What”s hidden behind the counter, and not on display is sure to be more interesting than the rest of the rummage.